Here are two of my favorite shades from the recently released Fall 2010 Sally Hansen Complete Salon Manicure Collection. There are a wide range of finishes in this collection, and if memory serves me correctly, there may have been one or two other shades (a red or raspberry, and a silver?) with this crushed glitter type of finish. Below: While green might not be your thing when it comes to nail polish, I love it! This rich dark olive shade with multi colored glitter is very pigmented, and the name alone--Sequin Scandal--would have been enough to persuade me to buy it. The gold glitter is the most prominent, but the other colors stand out well also. This reminded me somewhat of Color Club Snakeskin, but they are by no means dupes. Below: Problem Child is another one with a great name, but it's also a gorgeous shade. This very deep purple hue is filled with primarily violet, almost fuchsia glitter. This one has a lot of black in it, which makes for great coverage. This shade looks darker on the nail than in the bottle, particularly in lower lighting. I'm starting to see this display everywhere I go, so if you haven't been able to locate it, don't give up! I had no problems with the formula on these, and because they both seem to have a deep charcoal base, they're nearly opaque with the first coat. Two coats easily covered the few thin patches I had after the first coat. Have you spotted these yet? If so, did you pick any up? hi! i'm a new follower.. so i just wanted to stop by and say hello :) i must say these are amazing pics. i love the purple (my favorite shade) but the green is nice as well and i rarely go for the greens! great buy, i'm gonna have to look out for these. feel free to check out my new blog at fiercelyfreshfingertips.blogspot.com if you have a sec. These are absolutely gorgeous, love it! Sequin Scandal is stunning! I must be on the look out because it will be mine! O man they are just awesome, especially the purple one! !Lovely blog!! Try checking out mine. Oh.My.Goodness. I HAVE to have Sequin Scandal!!! Gah! I haven't been able to find these yet. But I NEED these two! Sequin Scandal has me holding my breath,until I see this in stores here! 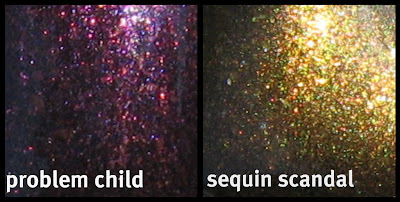 Sequin Scandal will be mine as soon as I find it! Those are gorgeous! I haven't seen them anywhere yet. Where did you find them? Cool swatches. Sequin Scandal reminds me of China Glaze's Wagon Trail. Are they dupes?